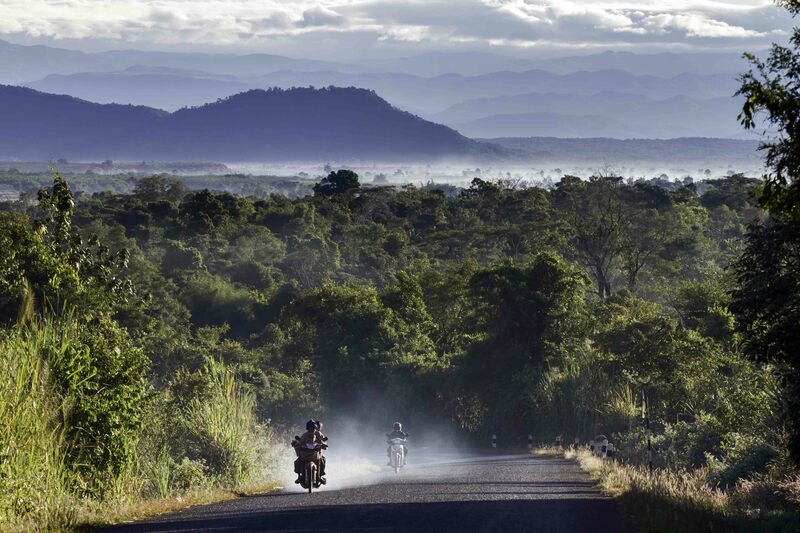 Pakse is often the starting point for journeys south, because there is easy access to rental cars and organized tours. 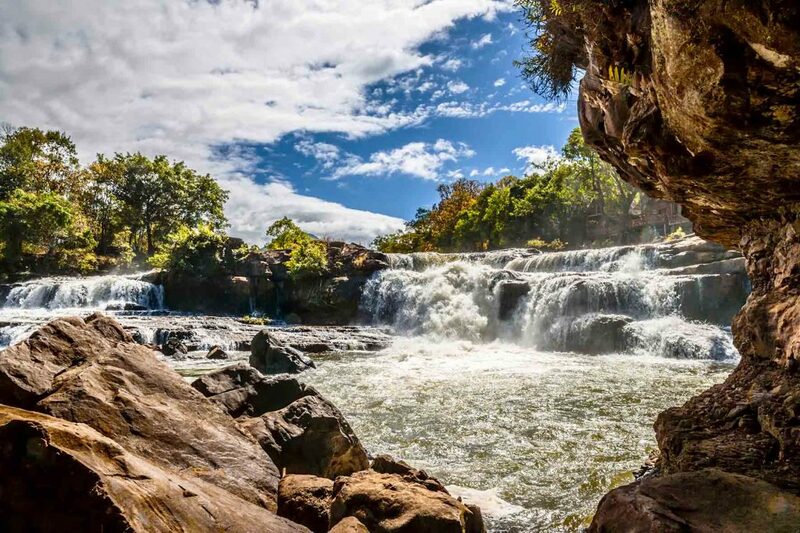 Pakse is a melting pot of tourists with several cafes and restaurants, while local tour operators in Pakse can arrange trips to the Bolaven Plateau or other attractions in the South. We decided to stay one night near Paksong, before being picked up by our tour guide the next day to drive into the unknown reaches of the Plateau. In the morning, we were picked up by our guide, Mr. Khamsone Souvannakhily of Mystic Mountain Coffee. 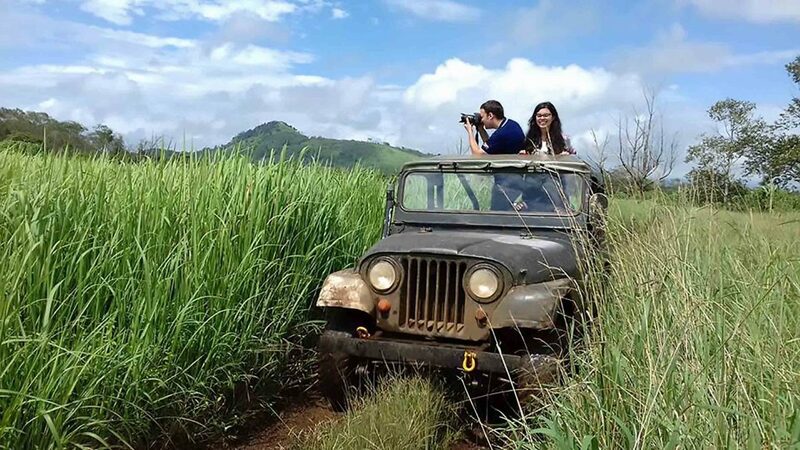 Khamsone arrived in a 1945-era army Jeep, a vehicle which adds a sense of adventure to the experience of the tour. Khamsone’s enthusiasm is infectious, fuelled by his passion for his advocacy and knowledge about the region, and coffee (of course), and the uniqueness of the Bolaven Plateau; his tour gave us great insights on the history of the Plateau and the start of coffee production 100 years ago. 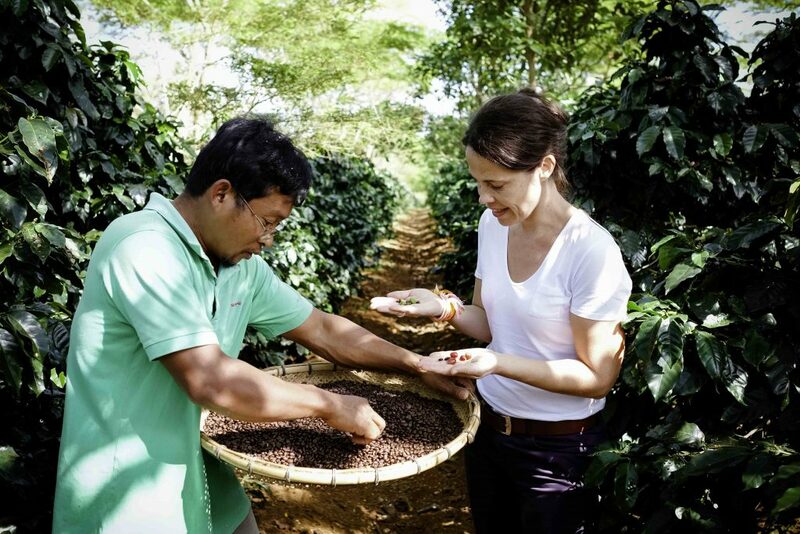 Born and raised in the Bolaven Plateau, Khamsone’s family has been working with coffee for more than forty years. His plantation is located at the heart of the Plateau, a two-hour and a half drive away, due to the poor road condition. It was an exciting ride while being greeted by smiles from children playing by the riverside. From a distance, the beautiful traditional Lao house stands in the middle of rows and rows of coffee plants and recently planted avocado trees all situated on a small hill. There is a large garden outside, with a coop for chickens and a pond for catfish. His house is immaculately kept, and the guest room provides much-needed comfort after the journey. Meals are included in the tour and guests are treated to huge servings of scrumptious Lao food prepared by Khamsone’s wife. During dinner Khamsone regaled us with stories about the secret American base on the Plateau during the Vietnam War, and that farmers are still in danger from unexploded ordnance (UXO) that has yet to be cleared. Khamsone started his career doing odd jobs and aided his education by learning and practicing English as a bellboy at a hotel. Little by little he was able to purchase land and fulfil his dream of having a coffee plantation. His plantation is now 16 hectares in size due to hard work and perseverance; but like any success story, it started with a failure. He is a farmer by heart; and after purchasing his farm, he started making profit for himself and his community by growing and selling coffee. 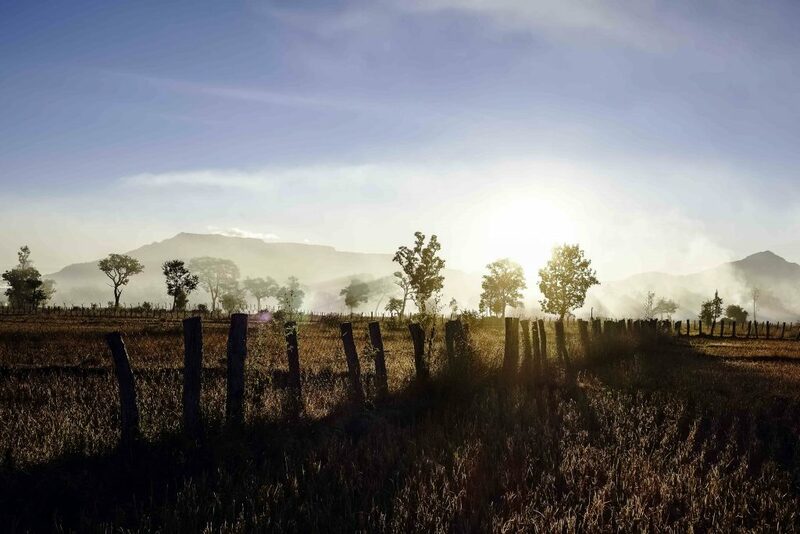 Then, in January 2014, half of his coffee field was destroyed by frost. Afraid of telling his wife what happened, he was urgently thinking of other ways to earn money. This was the starting point of Mystic Mountain Coffee Tours. 4 years later, supported by his good grasp of the English language, he’s at the top of his game. After a contented sleep, we woke to the sound of roosters, while a hearty breakfast awaited. We toured the nearby village, and Khamsone made his rounds to his workers’ houses. The women of the village do the sorting of the coffee beans. While the job might seem monotonous, it gives women the opportunity of working while taking care of the household. Through Khamsone, women are provided with a steady flow of additional income for their families. Additionally, if there are more guests joining the tour, then he will hire additional guides and jeeps. It was quite overwhelming to witness how much work goes into a cup of coffee, with most families in the villages of the Bolaven Plateau supporting themselves through the coffee industry. Seeing how the people of Khamsone’s village wake up before sunrise to plough the fields and pick the fruit, and how the women dry and sort the beans, it is a good reminder of the importance of knowing how ethically sourced your coffee is. Mystic Mountain Coffee Tours offers a deep understanding of the coffee process; from cherry to cup. The tours have expanded over the years to include trekking, jeep tours, coffee production lessons and cooking classes for guests. Mystic Mountain Homestay is located several hours outside of Pakse.